ModulesGarden Base For Magento is a free addition to any of our extensions and themes. It allows you to be up to date with currently installed ModulesGarden extensions as well as view other ModulesGarden products for Magento. ModulesGarden Base For Magento is provided along with each of our extensions and themes. Note: The only exceptions are our free extensions and themes downloaded directly from Magento Connect. Therefore, there are no steps required besides those listed in the extensions' installation (except step 5th). 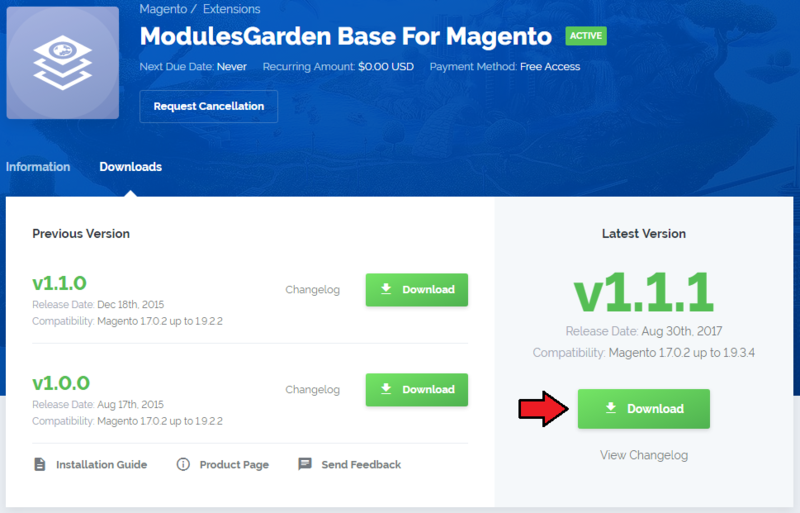 However, if you need to install ModulesGarden Base For Magento as a standalone extension, proceed with the steps shown below. 1. 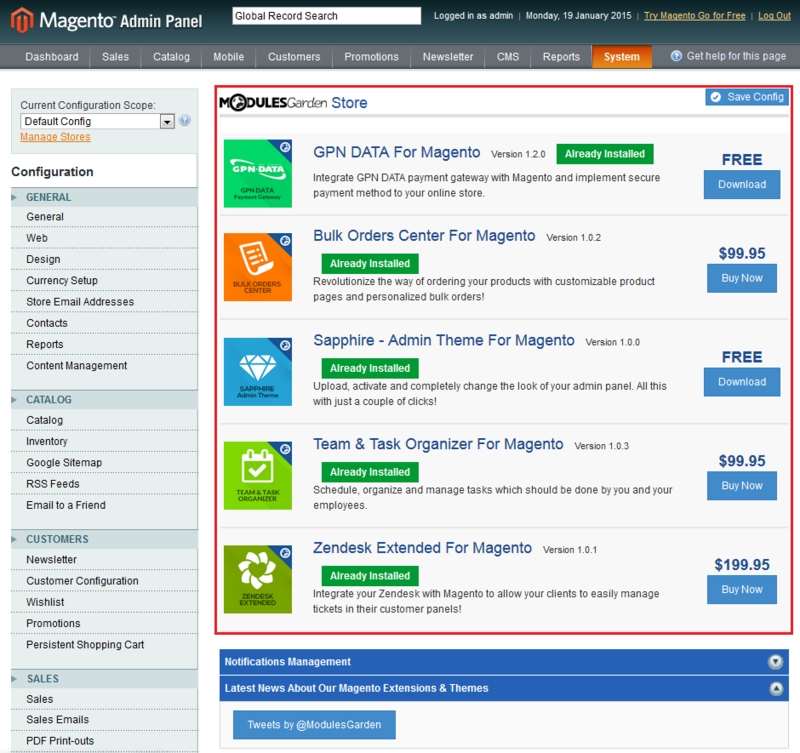 Download ModulesGarden Base For Magento. Files in your Magento directory should look like these. 3. Now, log in to Magento and go to 'System' → 'Cache Management'. 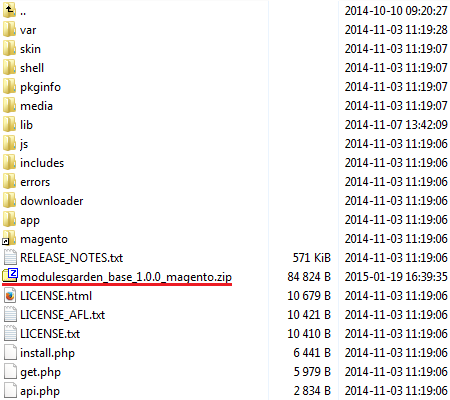 Press 'Flush Magento Cache', otherwise ModulesGarden Base will not even appear in your system. 4. 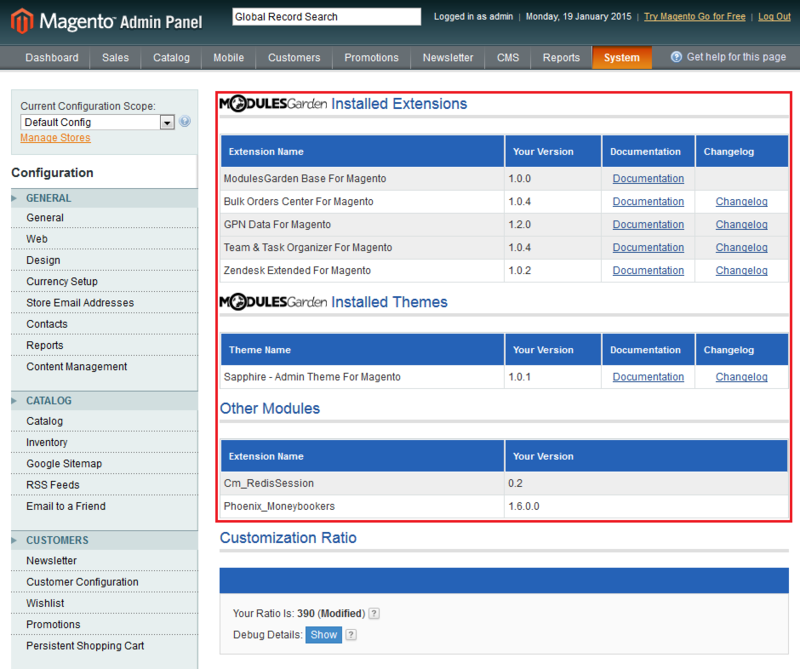 Re-log into Magento admin panel. 5. The last step is setting up the module cron job (required for notifications). 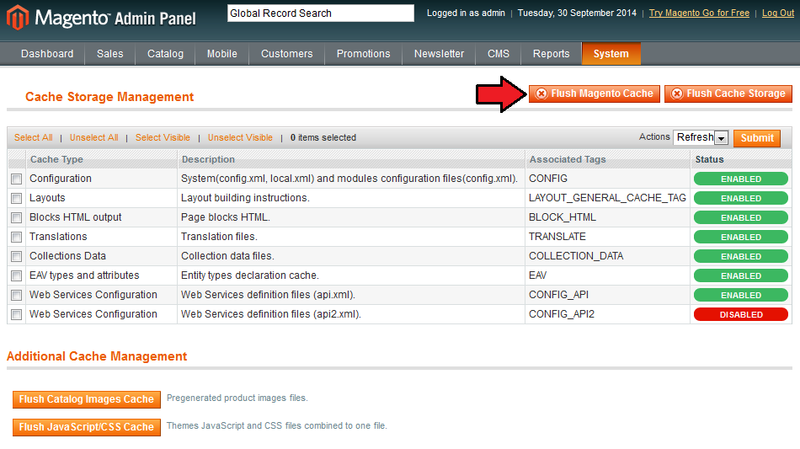 To do so, edit 'Log.php' file located in 'your_magento/shell/' folder. 6. 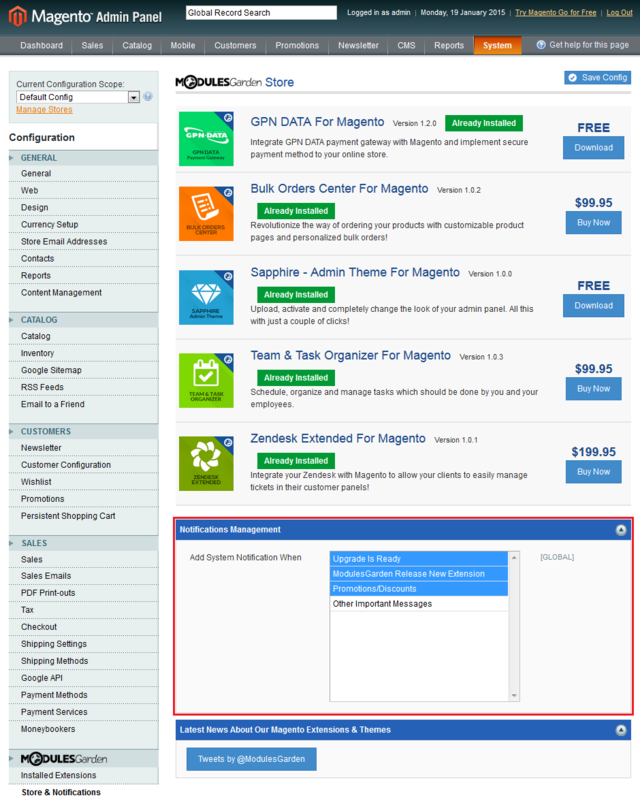 You have just successfully installed ModulesGarden Base For Magento! ModulesGarden Base For Magento allows you to track currently installed extensions as well as view all ModulesGarden products for Magento. On this page you can find the list of installed ModulesGarden themes and extensions as well as other installed extensions. As you can see on the following screen, ModulesGarden themes and extensions allow you to quickly jump to their documentation and changelogs. Besides extensions, this page shows you your system customization ratio. Its value depends on how heavily your system is modified. This page contains the list of all ModulesGarden extensions and themes for Magento. 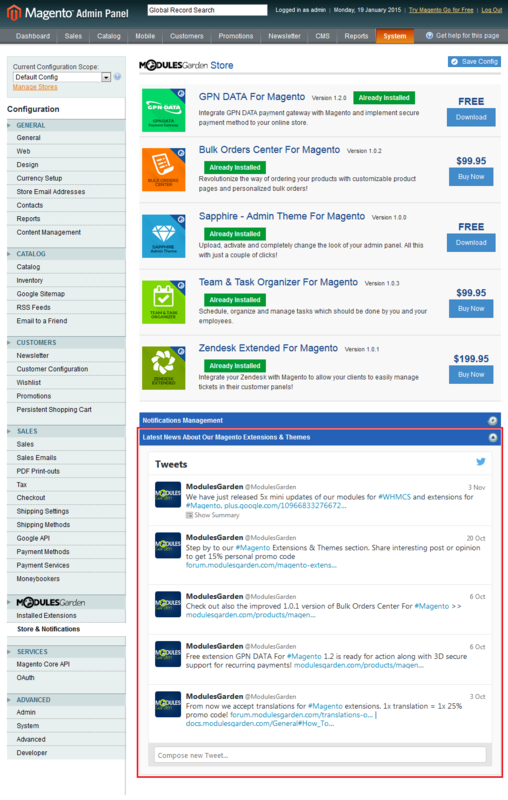 Additionally, you are able to view the latest ModulesGarden tweets concerning Magento.